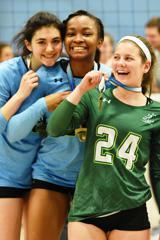 SMASH VOLLEYBALL is one of the oldest Juniors Volleyball programs in New England. SMASH has shown serious respect for each athlete, family, team and coach in all areas of training and organization. In addition, for more than 25 years SMASH has constantly maintained a position at the top of age-group performance performance results at the New England level and beyond. SMASH VOLLEYBALL trains and enters teams in NE Region USAV Juniors competition. Some teams play outside New England. We have competitive tryouts and train the teams 1-3 times/week from January through April/May/June. SMASH treats all players as serious athletes, and expects commitment, respect, effort, reliability, and adherence to all policies. We take our tryout process seriously, and feel every player selected should benefit from competition. Therefore all players receive regular playing time. We have no "bench" players. NE Juniors volleyball has two levels of play. “Open Level”- Teams must qualify for this classification. The Open Level is divided into Gold - Silver - Bronze - (and sometimes Copper.) The Open tournaments have a paid officials and entry fees. “Club Level” – All the teams in New England which are not Open teams. We do not allow players to drive by themselves long distances to tournaments or practices, and we require seat belts.